"Deceit follows on splendidly from Wickedness . . . The plot of this second story is enjoyably convoluted and, despite the subtle clues, I had no idea who I should be trusting and who would turn out to be a traitor. The climax is breathlessly great and fans of the first book will be happy to know that, although there's a satisfactory conclusion, White has left room for a third book. I'll look forward to it!" In the follow up to the thriller ‘Wickedness’, modern-day teen Claire and her seventeenth century counterpart Margrat discover it is impossible to escape the clutches of the sinister Doctor, who breaks the boundaries of time and mortality to pursue them both. Both girls must ask the question…who can you trust when wickedness returns? 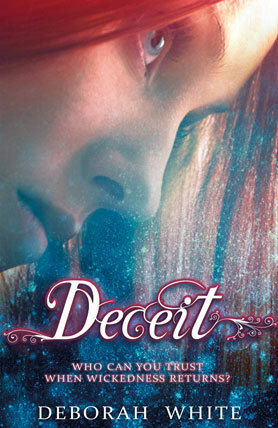 Excerpts from Deceit . . .
“Nah,” he (Silas) snarls and his spit flecks my face, “he’s finished that one. He won’t live. He’s knocking at Death’s door and will soon be let in.” He takes out a knife and holds it against Jeanne’s cheek. I scream and grab the blade in my hand and try to push it away. I can see blood, but strangely I feel no pain at all. Then just as I think he will pull the knife from out of my hand, slicing it in two, a look of surprise crosses his face and his grip on the knife handle weakens. He topples sideways onto the ground. Martha is on her feet and has plunged her knife into his back and with great accuracy. This time the knife wound is fatal. Martha looks about her hurriedly, but in the commotion no one has noticed Silas fall. She pulls out the knife carefully and wipes it clean on Silas’s jerkin. Then together we drag his body into the nearest alleyway and run.